Today I wanted to share a pregnancy update! I think sharing my updates on here rather than in vlog form is a lot easier especially since things change so subtle week by week. I cant believe we are this far along!! I will probably be sharing updates every 2 weeks as this belly grows and grows! How Far Along: 28 weeks 6 Days. Tomorrow I turn 29 weeks! How Big Baby Is: Somewhere between 2.5 and 3 lbs already! 16inch in length about the size of a coconut! Movement: She is moving Day and Night. Shes got the wiggles for sure. Some movements I swear have been so aggressive it startles me! She also gets the hiccups about twice a day! Sleep: Throughout this entire pregnancy, sleep has been hit or miss. Sometimes I sleep great and sometimes I’m up all night….unfortunately last night I was up all night. What I Miss The Most: I miss clothes of course. I actually miss my normal jeans. I also miss diet coke and any caffeine in general. Maternity Clothes: I just shared THESE jeans yesterday on my insta-story. They are great! 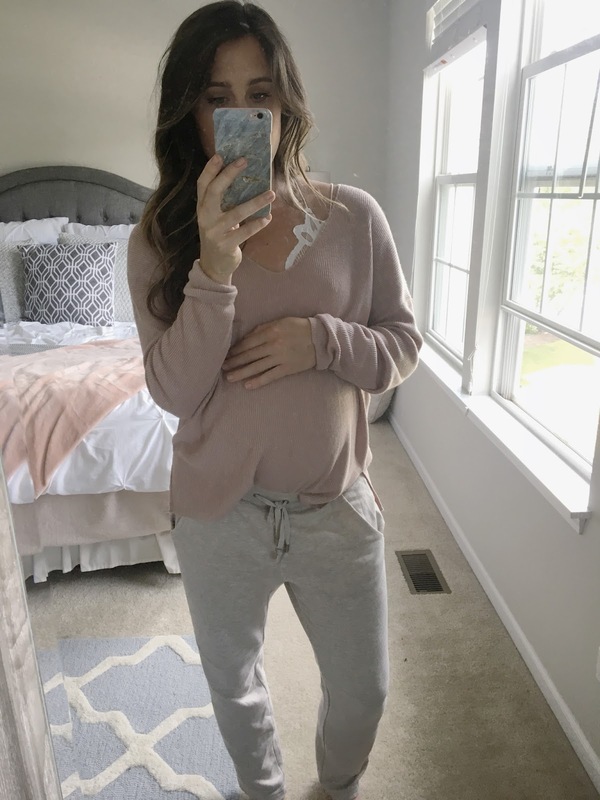 I also have been wearing THESE maternity tees which are such a good deal and super comfortable! Also I wanted to share THIS non-maternity dress that I have been loving!!! Cravings: Actually not a ton….I had a craving for chili the other day and puppy chow but I think thats more fall related. Every time football season comes around I am ready for chili and puppy chow. Don’t Ask haha. Besides the chili, I have actually had some serious aversions to anything spicy…..even things that have a little spice. I just want to eat bland food. Feeling: This pregnancy overall has been a little rougher than my first. I have really good days and some not so great days. I find that if I can keep myself busy the bad days aren’t so bad. I had a spout of really crazy Braxton Hicks contractions around 25-26 weeks. They have kind of slowed down and I only get some at night now. I think I was dehydrated before which is NOT good. I feel so much bigger this time around so it just makes things harder to do! Overall though not too bad. Appointments: I just had my glucose test this week. All results came back healthy and good. Everyone always freaks out over the glucose test and I don’t think its that bad. I also had to get a T-dap shot and a Rho-gam shot because I have a negative blood type. I hate shots…UGH! The doctor also told me its time to meet every 2 weeks! Ah I can’t believe we are at that point already. Doing: Well I mentioned last week I was so behind on baby nursery. Well I have made major progress due to Labor Day Sales haha. We are using Eli’s crib since he transitioned to a twin bed. The dresser my mom is re-purposing….which she is so crafty and I can’t wait for you all to see it! I also got her glider, a pouf, a mirror, and a cute vase. I need a couple more things and we are set! I want her room very minimal and not cluttered. I want it to be a sweet warm space but not feeling like there is stuff everywhere. If you have any suggestions for great baby gear, let me know in the comments or on IG!